I'm Running to Eat! : What do you eat during a major flood? What do you eat during a major flood? Why Chicken Pizza, of course. We woke up early Saturday morning to a phone call from our county's reverse 911 system informing us that our county was in a state of emergency due to the almost 10 inches of rain we'd gotten the night before. Which was on top of the 38 inches of rain we'd gotten so far this year (and 41 inches is our average for the entire year!) Schools and homes under water. Roads and bridges washed out. People being rescued by boat from their homes. Unbelievable. Luckily we are okay and with some property damage, all of our family members are okay too. After spending the day in shock and watching all the TV footage, eventually the inevitable happened ... we got hungry. What do you make for dinner when all roads are closed and you are limited to what you have in your pantry? Pizza! 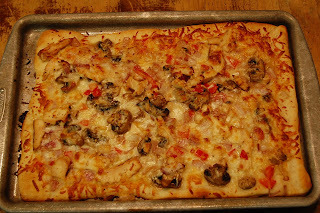 This Chicken Pizza recipe is one I've blogged about before but it is still delicious, quick and filling. Add chicken, salt, pepper and garlic and heat it for few minutes. Add onions, bell pepper, mushrooms and thyme and saute for few minutes into the chicken mixture, until chicken is cooked. Keep it aside. Unroll pizza dough and pat into a 12-inch pizza pan coated with cooking vegetable spray. Splash half cup cheese evenly over the dough. Spread chicken mixture over the cheese and top with remaining 1/2 cup of cheese. And bake at 425 degree Fahrenheit for 15 minutes or until crust is golden.